Cruise the world and your kids sail for FREE! From the charms of the Caribbean to the wonders of Europe, kids 11 and under can enjoy it all with our compliments. What’s more, we offer countless activities that offer captivating adventures for everyone. *Children 11 and under sail free when sailing as 3rd / 4th guests in the same stateroom as two full-fare paying guests. Amenities vary by ship. Not all amenities available on every ship.. Ship’s registry: Panama. Carnival’s 72 Hour Sale is back! 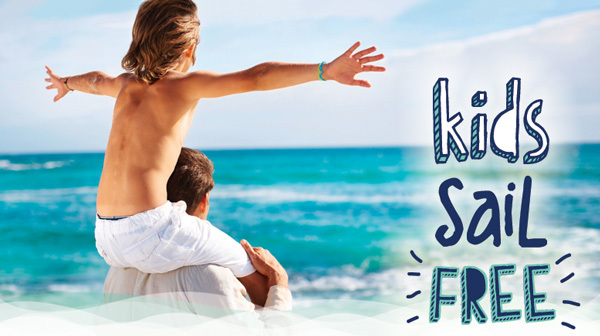 For three days only, you can book Fun Select rates and save up to $100 Cash Back per stateroom on select sailings through May 2013. If you have cruised with Carnival before, you’re eligible for Past Guest rates AND best available upgrades on select sailings through May 2013. But that’s not all…we’re offering select holiday sailings between December 20, 2012 and January 1, 2013 at Fun Select rates and with up to $200 Cash Back per stateroom. Sale runs from Tuesday, July 10th through Thursday, July 12th so act fast! Contact us for more details or a personalized quote.